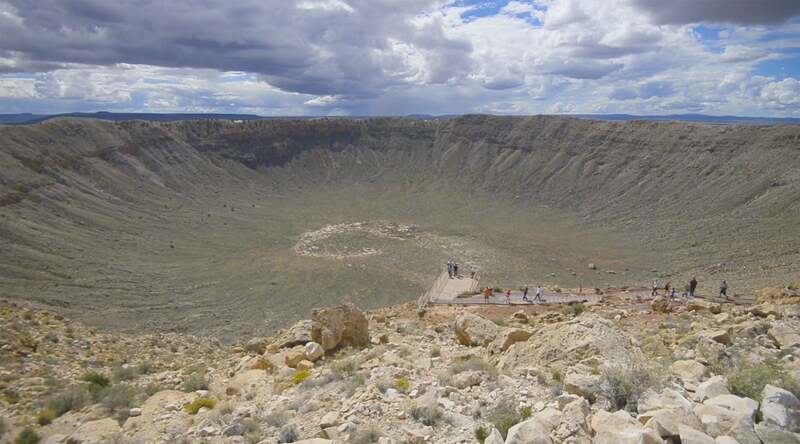 About 50,000 years ago, an asteroid collided with the Earth, leaving a mile-across impact crater in what is now northern Arizona. And every fall, it makes a new impact on Arizona State University students. Those enrolled in SES 121: Earth, Solar System and Universe — an introduction to Earth and space sciences for incoming majors in the School of Earth and Space Exploration — take a day trip to northern Arizona each fall to gain "eyes-on and hands-on" experience in the field, beyond just textbooks and lectures. "What does the geology really look like and feel like, in person? What do professional astronomical telescopes look like and what can you see through them, in person?" said professor Jim Bell, a planetary scientist who co-teaches the course with associate professor and astrophysicist Jennifer Patience; they handle different parts of the trip. "Lots of research shows that students learn best by seeing and doing and experiencing concepts and processes firsthand, rather than just looking at pictures or memorizing facts. "The only way to get those kinds of experiences is to go out there and visit these places, and we're very lucky here in Arizona to have such a great collection of geological phenomena and astronomical resources right here." The site visits begin at Meteor Crater (pictured above) and continue at Walnut Canyon National Park for additional geology lessons. They then travel to Lowell Observatory in Flagstaff for astronomy instruction and telescope observing. Watch the crater visit from this year's visit in early October. It's one of a number of programs at the School of Earth and Space Exploration meant to inspire students, Bell said. "We take a similar trip with SES 122 in the spring, up to Payson to see firsthand many of the details of the geology of Arizona, the Colorado Plateau and the desert Southwest," he said. "Professor (Mark) Robinson takes students in his planetary geology class on a field trip up to visit volcanic, impact, tectonic and sedimentary features in northern Arizona. "Other professors take classes on field trips down to the professional telescopes outside of Tucson, and even out to JPL (Jet Propulsion Laboratory) in Pasadena, to see and meet firsthand many of the people involved in planetary and space science. "Also, we have lots of hands-on experience for engineering-focused students as well, including introductory to senior capstone classes where students design, build, test and operate a variety of robotic systems and software applications. It really is a dynamic, and hands-on, learning environment."